In May 2003, Bo Xilai transferred Wang Lijun to Jinzhou as police commissioner. Wang does not have a medical background, but soon after he took up the position, he established an “On-Site Psychological Research Center” located under the Jinzhou Public Security Bureau. 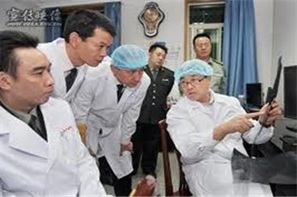 In September 2004, Sanlian Life Weekly contained an article titled “Tianjin Survey: Asia’s Number One’ in Organ Transplantation,”6 in which the head medical resident at Tianjin Oriental Organ Transplant Center, Zhang Yamin, said that donor organ procurement is costly, that a single organ perfusion preservation solution is not a small expenditure, and that every major organ requires four bags of preservation solution at 5,000 RMB each. At the beginning, there were no domestic manufacturers of perfusion solutions, so they had to use preservation solutions brought back from Japan, bag by bag, by Shen Zhongyang. In June 2005, Liao Shen Evening News reported an example of Wang’s work, “the entire process of lethal injections in death-row prisoners,” which was intended to help more people understand the research.8 At 5:00 am on June 9, 2005, in Cuijiatun in the Jinzhou City Economic and Technological Development Zone, a field experiment and study was carried out with a lethal injection. A researcher gave the following introduction. The reporter described the experts gathered at the execution site as if they were staff of a research laboratory. The reporter referred to Wang Lijun as the director of the Psychological Research Center. The reporter also listed professor and doctoral advisor Xi Huanjiu, the dean of Jinzhou Medical College, and other experts in medicine, criminal investigation, and psychology. They were described as conducting psychological analyses and clinical research on reportedly violent criminals who received the lethal injections. Wang Lijun also presided over a major project on atraumatic dissection in the Asia-Pacific region.10 As shown in the center’s introduction, above, institutions that took part in this project included the Swiss Virtual Dissection Foundation, the Tribunal Science Institute of University of Bern in Switzerland, Medical University of Graz in Austria, China Medical University, Jinzhou Medical College, and the People’s Liberation Army Hospital No. 205. 人体实验-2015-07-17_20-09-07-現場心理研究中心-2.png,人体实验-2015-07-17_20-09-07-現場心理研究中心-3.png,The cooperative units of the Research team on transplants with organs extracted after lethal injections: Peking University, China Medical University, Jinzhou Medical School and the People’s Liberation Army Hospital No. 205. 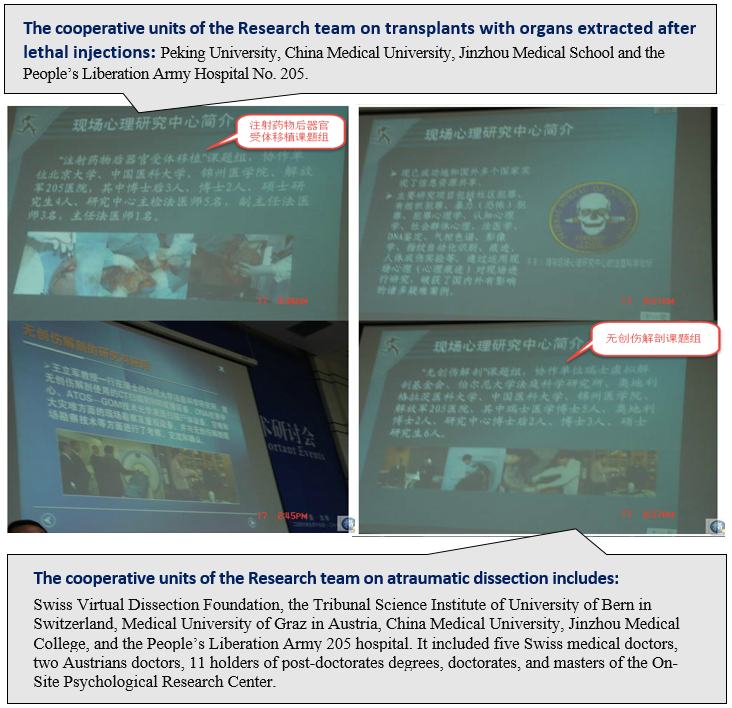 Swiss Virtual Dissection Foundation, the Tribunal Science Institute of University of Bern in Switzerland, Medical University of Graz in Austria, China Medical University, Jinzhou Medical College, and the People’s Liberation Army 205 hospital. It included five Swiss medical doctors, two Austrians doctors, 11 holders of post-doctorates degrees, doctorates, and masters of the On-Site Psychological Research Center. Between 2003 and 2008, Wang Lijun carried out thousands of what were effectively live human experiments. This raises questions both as to how Jinzhou, a third-tier city, had thousands of death-row prisoners available for these experiments, and whether the prisoners were actually conventional death row convicts. The paper referred to a software simulation in which this process would be explored, to provide data for real-world scenarios. The paper also set out an experiment, stating that until October 2007, twelve corpse heads were used for the impact tests. All the subjects for the experiments were male, age 26-38, and with an average age of 31. However, the overall purpose of the study seems contrary to its claim of saving lives. Instead, it studies injuries to the brain at different levels resulting from violent impacts to the primary brain stem. Victims are left with various levels of cognitive and sensory motor dysfunctions, which can lead to life threatening respiratory and circulatory malfunctions.14 Therefore, this process could be used to determine how best to kill. An impact to the temple that is placed just right can cause brain stem injury, loss of consciousness, and even brain death. The heart is still beating, and various organs and tissues continue to live. This impact is an effective alternative to lethal injection while maintaining organ function and reducing rejection responses. 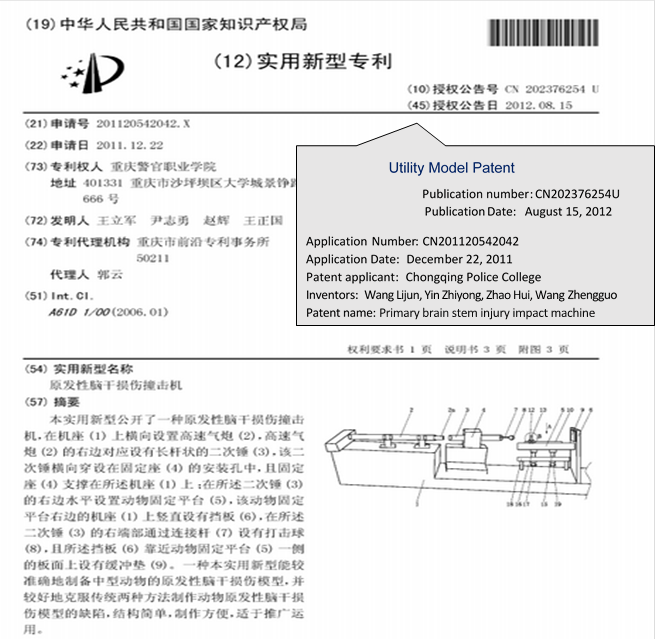 The protection of utility model patents is ten years from the filing date in China. It is odd that this patent application was submitted on December 11, 2011 and published in August 2012, but its current legal status shows that the patent was terminated in February 2016. "Cover story – Thoroughly expose Wang Lijun Source: Southern Weekly Issue 48, December 17, 2012"
"China jails Bo Xilai’s former police chief Wang Lijun for 15 years Source: The Guardian, 24 September 2012"
"The Slaughter pp. 260-269. For the plastination reference see pp.296-303"
"The Speech of Professor Wang Lijun at the Award Ceremony of “China Guanghua Science and Technology Development Foundation Special Innovation Contribution Award”"
"“China Guanghua Science and Technology Development Foundation Special Innovation Contribution Award” given to the public security front researchers Beijing Guanghua Science & Technology Development Foundation official website September 21, 2006"
"Tianjin Survey: No. 1 of organ transplants in Asia Source: Sanlian Life Weekly 2004-09-22 the 38th issue of 2004 Author: Wang Hongliang"
"Eyewitness: “cannibal demons “calmly accepted lethal injection, source: Liao Shen Evening News June 13, 2005, Jinzhou Correspondent: Chang Chin"
"The Psychological Research on-site Center of the Public Security Bureau in Jinzhou City The official Website of the Ministry of Commerce of People’s Republic of China"
"Wang Lijun, former deputy Mayor of Chongqing"
"Wang Lijun and his mysterious research Center Source: Epoch Times, 2012-04-19"
"Corrupt official engaged in inventions sought profit and fame through patents Source: Beijing Youth Daily, August 27th, 2014"
"Finite Element Simulation and its Clinical Significance of Traumatic Brain Injury Caused by Temporal Impact in the Quasistatic State Source: CNKN. net"
"Brain stem injury Medical Encyclopedia"